The new paper on ancient DNA from elephants, mammoths and mastodons, A comprehensive genomic history of extinct and living elephants, is pretty cool. It leverages next-generation sequencing and ancient DNA, to reconstruct the demographic history of several species of elephants, extant and extinct. The major core finding is that ancient DNA along with better data from extant species suggests that straight-tusked elephant of Europe (P. antiquus), which went extinct 50,000 years ago, seems to have been an evolutionary synthesis of sorts. A substantial portion of its ancestry as from a deeply diverged lineage of elephant. But another fraction seems to derive from a branch of the African forest elephants, in particular, the West African variety. Finally, earlier on there was also admixture with an Asian pachyderm related to the woolly mammoth. 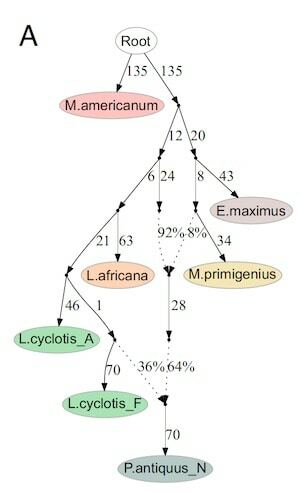 You can see from the figure at the top that the divergence between these lineages is on the order of hundreds of thousands to millions of years. 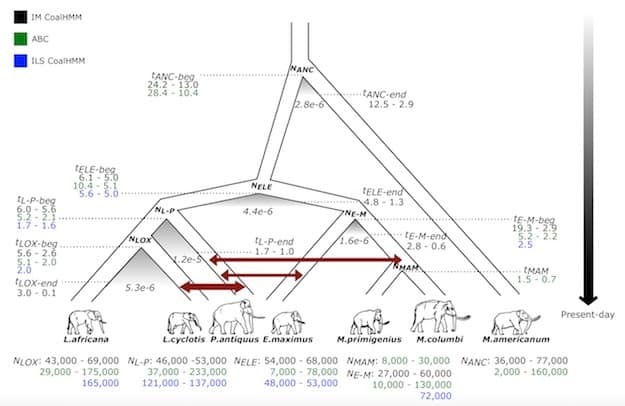 Our genomic analyses of present-day and extinct elephantids revealed a history of multiple major interspecies admixture events. Evidence for gene flow among closely related mammalian species is not unprecedented. Examples include cases of unidirectional gene flow [e.g., from polar bears into brown bears (47), similar to the Columbian mammoth gene flow into woolly mammoths observed in our study]; emergence of admixed species [e.g., North American wolves with ancestry from coyotes and gray wolves (48), similar to the straight-tusked elephants in our study]; different extents of gene flow [e.g., between gray wolves and Eurasian/African golden jackals (49), and between bonobos and central/eastern chimpanzees (50), as in the case of straight-tusked elephants and west African forest elephants/woolly mammoths in our study]; extended periods of gene flow during the initial diversification of species [e.g., between eastern and western gorillas (39), Sumatran and Bornean orangutans (39), and the ancestors of humans and chimpanzees (39, 51), like those inferred from most pairwise species comparisons in our study]; and adaptive introgression [e.g., in the great cats of the genus Panthera (52)], which could have played an important role in the evolution of elephantids as well. Our results in elephantids thus add to the growing weight of evidence in favor of the view that capacity for hybridization is the norm rather than the exception in many mammalian species over a time scale of millions of years. 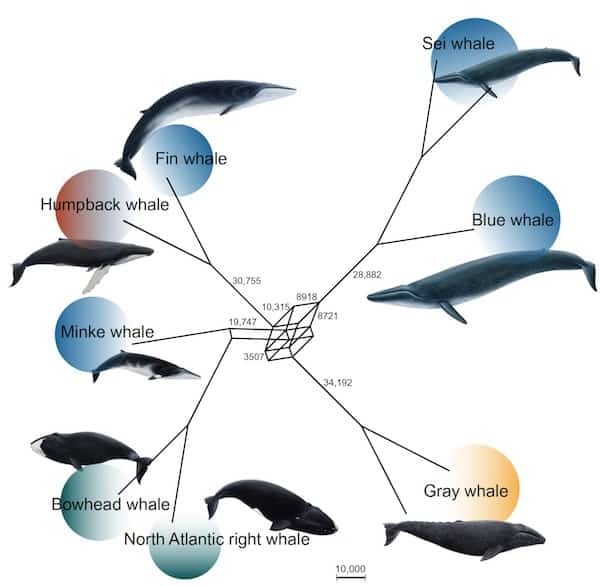 Big speciose mammal lineages seem to have hybridzed a lot. Should this surprise us? Probably not. 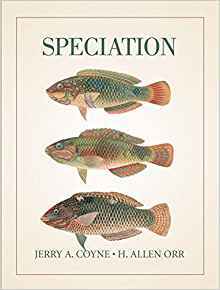 A central question in evolutionary biology is why animal lineages differ strikingly in rates and patterns of the evolution of reproductive isolation. Here, we show that the maximum genetic distance at which interspecific mammalian pregnancies yield viable neonates is significantly greater in clades with invasive (hemochorial) placentation than in clades with noninvasive (epitheliochorial or endotheliochorial) placentation. Moreover, sister species with invasive placentation exhibit higher allopatry in their geographic ranges, suggesting that formerly separated populations in mammals with this placental type fuse more readily on recontact. These differences are apparently driven by the stronger downregulation of maternal immune responses under invasive placentation, where fetal antigens directly contact the maternal bloodstream. Our results suggest that placental invasiveness mediates a major component of reproductive isolation in mammals. Monkeys and apes (including humans), have very invasive placentas. Afrotheria, somewhat less so. Placental invasiveness isn’t the only criteria to predict or gauge the viability of hybridization, but it’s a major one. 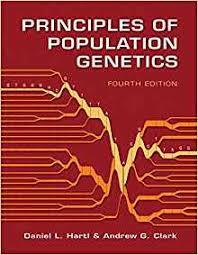 I’ve stated before that genomics didn’t really change our understanding in a qualitative way in relation to evolutionary biology. Yes, stupid arguments about selectionism vs. neutralism really don’t happen anymore because there’s a mad scramble for data, as opposed to rhetorical tactics. But, perhaps in the area of understanding speciation with regards to mammals genomics has really changed things. 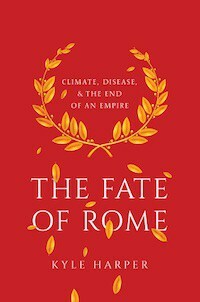 That is, it’s a lot more about reticulation and a lot less about bifurcation. 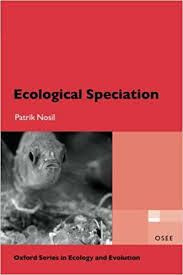 To a great extent the “biological species concept” (BSC), which to the general public is the scientific species concept, is mammal focused. If plant geneticists had the catbird seat I think we’d have a different view of what species were. As it is, that’s not what happened. 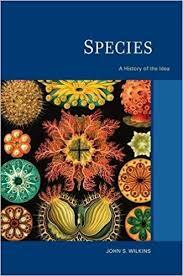 Species are human constructs and reify a certain Platonic sense of categories and kinds. What genomics is showing us here is even in the “best case” circumstances of the BSC, in mammalian lineages, when evaluated over reasonable time spans species barriers are highly porous.